This article gives an overview on how to interface a USB Touch device on Toradex modules. Single-touch refers to a single physical contact point whereas multi-touch refers to support for two or more concurrent physical contacts. This driver supports single-touch only. Multi-touch support has not been implemented yet. Download the respective OS driver and extract the relevant ZIP package. Copy the Autorun folder and paste it into a Pen drive or SD card. Power ON the Toradex Windows CE device. Connect the Pen drive or SD card to the device. The driver will install automatically. After successful installation of the driver, please reboot the system. Connect the USB Touch device to the system and verify if it is working. Please verify if the following debug print is displaying on the debug console when connecting the USB Touch to the Windows CE device. if not, get the VID and PID of USB Touch device(refer the How to get USB touch VID and PID) and add the following registry in the Windows CE device. Save the registry and reboot the device. Now verify, if the debug message is displaying on the debug console. Enable ForceUseRegistry to get Touch physical resolution (get it from the datasheet or refer How to get USB touch physical resolution). Configure the HorizontalResolution and VerticalResolution registry entries using the Registry Editor (StartMenu-> Programs->ColibriTools->Regedit) Tool. Save the registry, reboot the device, and verify if the touch is working. If the USB Touch is not working after completing the above procedures, please save the USB Descriptor details (refer How to save USB touch HID descriptor details) of USB Touch device and please send us an email at support@toradex.com to get support from our engineers. Install the USBlyzer software on PC from here. Connect the USB touch Device to your PC. Please check to confirm if the device tree window is refreshed. Select newly connected device(refer Fig 1 - step 1). 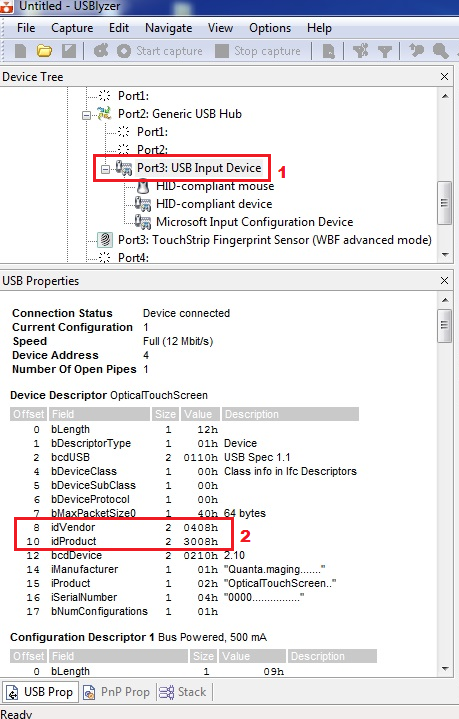 “idVendor” refers to <VID> of the USB touch device and “idProduct” refers to <PID> of the USB touch device. Follow the steps 1-5 described in How to get USB touch VID and PID. USB descriptor details will be shown on USB properties window. Please navigate to Usage page – Digitizer and Usage – Touch under the HID Report Descriptor section (refer Fig 2 - step 2). Please note that the physical maximum value which immediately comes after the Usage(X)(refer Fig 2 - step 3).It is the Horizontal resolution(HorizontalResolution) of USB Touch. Similarly, note the same for Usage(Y) (refer Fig 2 - step 4). It is the vertical resolution(VerticalResolution) of USB Touch. USB descriptor details will be shown on the USB properties window. Please right click on the USB Properties window and click “Export…”. Enter a name for the file list in the edit box indicated by “File name” and then click “Save” button.